Sunway City Berhad (SunCity) continues its successful track record with the public viewing of A’marine, a luxury lakeside condominium in Sunway South Quay, located within the Sunway Integrated Resort City (SIRC). Themed ‘A Night of Carnival Excitement’, SunCity successfully sold close to 80% of its units. To date. A’marine has a gross development value of RM200 million and comprises 242 units. Sizes of units will range from 1,306sq ft to 2,836sq ft. The guests were truly entertained by a string of performances by street magicians and an eye-catching fire eating act that lit up the whole atmosphere during the evening. Children were also delighted by several clowns that gave out free souvenirs throughout the night. Additionally, all guests were treated to a sumptuous assortment of local delicacies. Sunway South Quay's development strategy is Blue, The New Green where the lake takes centre stage. Residents will enjoy a "paradise" secluded from the hustle and bustle of the city but with plenty of world-class amenities at their doorsteps. Surrounding the lake is an impressive 1.5km promenade for recreational purposes where residents can walk, jog and relax comfortably. As a result, residents will have the unique opportunity to spend quality time with their family beside the lake. There will also be a 77-foot luxury yacht called the South Quay Princess, anchored by the side of the lake. The luxurious yacht, which was specially transported to the site, can be rented by the residents of SSQ to host parties or business meetings. Sunway South Quay will be a lifestyle paradise of its own with alfresco dining, designer cafes, international restaurants, lakeside boutiques as well as retail and shopping lots in future. Ho added that the appeal of A’marine is strengthened further as it is located within the SIRC, which is a hub of award-winning and world-class shopping, leisure, entertainment, education, recreational and commercial facilities. All these components make SIRC one of the most comprehensive integrated developments in the country. 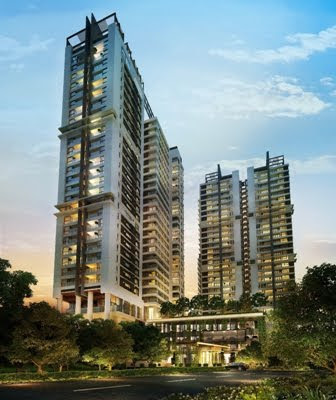 The success factors for this good response for Sunway South Quay are due to several key factors. All the world-class and award-winning amenities are already completed, namely education, which is Sunway University College, Monash University Sunway campus and Sunway International School; healthcare with Sunway Medical Centre; shopping with Sunway Pyramid Shopping Mall; leisure with Sunway Lagoon and hospitality with the 5-star Sunway Resort Hotel & Spa, which constitutes of the 4-star Pyramid Tower & Resort Suites (service apartments) and the exclusive Villas chalets. Sunway South Quay enjoys good connectivity as residents of SSQ will enjoy free bus shuttle service to all the locations mentioned within the SRIC. Proposed future access includes an elevated highway linkage from the Shah Alam Expressway (Kesas) and New Pantai Expressway (NPE). For further enquiries, kindly contact us at 03-56381000 or 03-56399000.